MPPT Meaning maximum power point tracker: a high efficiency DC to DC converter that presents an optimal electrical load to a solar panel or array and produces a voltage suitable for the load.most commonly for a solar panel or array, and converts the power to a voltage or current level which is more suitable to whatever load the system is designed to drive. 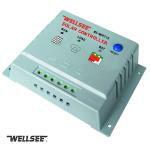 What Advantage of MPPT solar controller? 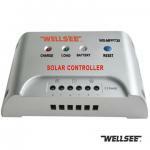 Previous： How to choose a suitable solar controller?